If I had an actual classroom, Banned Books Week would be every week. And that’s one of the many reasons I am sure I would be fired and I do not teach in public schools! I cannot follow rules, I don’t like paperwork, and I’m all about no testing and letting kids follow their own passion. If a kid asked me if she could read Stephen King instead of Shakespeare, I’d say, “Go for it!” You’ll find the same passion, the same violence, and the same humor, after all. One will just be harder to read. I read my first banned book when I was about ten. 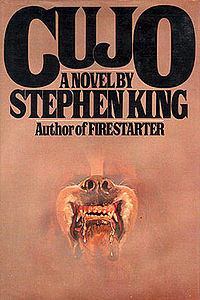 I found a copy of Stephen King’s Cujo on my grandmother’s huge, imposing bookshelf (which is now mine) in her hallway one day and just sat down with it in the dark corner, secretly afraid that the cover would bite my fingers off. Yeah, I like to joke about that being child endangerment—especially since my grandma, my mother, and my fifth grade teacher all knew that I was reading it!—but it was the beginning of a life-long love of not just King, but reading.